It's baaaaaaaaack! We've finally entered summertime and that means that The Bachelorette has returned. Chelsea, Alisa, and Rebecca are also back and they're ready to chat about all things related to their favorite (and sometimes frustrating) reality franchise. Joining them this season is your favorite Blindspot reviewer, Jen K.! Who had the best or most memorable introduction gimmick? Who had the worst? Alisa: Okay, so I thought the chicken guy would turn out to be the worst, but fortunately he was super sweet and even though I’m not a fan of people dressing up in costumes to be memorable, his personality ended up making it work and he became the most memorable in a good way! The worst was the guy who brought the cardboard cut-out of Arie. It was bad enough that like half the contestants mentioned Arie during their introductions (and we had to re-watch that agonizing break-up), but the cut-out was too much! Also, I think I was the only one in America who didn’t like the whole pulling up in a van thing? Even before I knew Garrett was problematic, I thought the van thing was cringe-worthy and slightly Stepford Wife-y, but to each their own. Becca obviously liked it. Seconding Alisa, the guy (don’t even remember his name) with the cardboard cutout of Arie had the worst entrance. Who wants a life-size photo of their ex when they’re trying to meet 30 new guys? I also didn’t like the guy (again, don’t remember his name) who wanted Becca to compromise 60/40 with him. Yikes. Jen K.: I’m going to give best to Garrett because the minivan was an inspired choice. Also, that’s zeroing in on my demographic so I might be biased. #MinivanMom Chicken guy was also extremely memorable and — shock of shocks — pretty darn cute. I’m with Alisa. Cut-out Arie was the worst. Chelsea: I was really charmed by the chicken guy and problematic Garrett’s entrances. I’m definitely the type who likes a goofy partner and they nailed it. Worst EASILY goes to the 60/40 guy who was later cut. Becca even mentioned him needing to turn around and leave after his entrance. Rude with a bad haircut doesn’t go far with the ladies. Overall, most of the entrances were pretty dang forgettable. Garrett might have received Becca’s first impression rose but he certainly didn’t get America’s. Who left the best impression on you night one? When will the producers hire social media investigators for the contestants? Alisa: I’m in love with Clay! He was so, so sweet and adorable and just seemed like such a genuine down-to-earth dude who’s — wait for it — HERE FOR THE RIGHT REASONS! But for real, y’all. I don’t really see Becca choosing him in the end, but I hope he goes far enough that he gets chosen to be the next Bachelor. Also, I don’t believe for a second the producers aren’t well aware of their problematic picks like Garrett (and Lee last season). They’re totally putting guys like that in to ramp up the drama. Rebecca: My favorites so far are Clay, Blake, and Leo. Clay and Blake are absolute sweethearts, totally here for the right reasons, and seem super genuine and open to finding love. Leo... we don’t know too much about him yet, but I’m super into him and his luscious hair. And ABC totally already has social media investigators, they just don’t care. Like with Lee on Rachel’s season, how are the producers not going to know they brought on a racist for the first season featuring a black Bachelorette? I think the producers like to stir up the pot by bringing on controversial contestants. To be fair, someone did some absolutely insane digging to get the dirt on Garrett, but the type of person who “likes” things on social media making fun of trans folks and school shooting survivors most likely isn’t the greatest person IRL. Jen K.: I’m here for Clay. Clay is my guy. I really liked Garrett until I found out about his Instagram. I’m new to all of this. The last time I watched The Bachelorette, Instagram didn’t exist (all my love Trista and Ryan). So I was rather floored that the producers didn’t know because they have to know, right? It’s super shady they keep people like this around. More worrisome is Becca on every morning show defending Garrett, so sadly, he sticks around. Chelsea: Again, I’m so disappointed with the whole Garrett thing because I love a goofy dude. I know he didn’t post anything and that somebody went through a whole lot of work to find those likes, but still. Producers are just gonna have to keep stepping up their vetting game because this one was pretty difficult to find unless you were friends with him and followed a bunch of the same accounts he was liking. I’m completely biased because Clay is an alum of my college and I briefly met him before; he was super nice then and even sweeter on the show. He’s the kind of dude that you get what you see and is such a cool and charming human — my frontrunner for the Bachelor. Blake, Wills, Leo, and Jason also really left me with really good vibes. The only thing better than finding love on this show is finding a villain. Who has good villain potential? Is the male model there to stir the pot or is he just a doofus? Alisa: I think the male model — while fun to laugh at/with — doesn’t have what it takes to be this season’s villain. He’s just pompous fluff in great shoes. It seems like Garrett’s true colors didn’t surface until after the season wrapped, so I’m guessing he’s not the villain either. I don’t know. I didn’t get strong bad guy vibes from any of them on night one, but enough of them look like your typical Disney villian that I figure someone will step forward to claim that title soon enough. Rebecca: Jordan is definitely the Corinne of this season, although probably not quite as conniving and sneaky. He brings the goofy drama though, and he’s a total diva. I actually laughed out loud when he said there were less than 100 male models in the United States and compared his footsteps to a gentleman’s heartbeat. He’s entertaining and annoying, but not mean (at least not yet), so I don’t see him becoming a villain. I think it’s a bit early to tell who will be this season’s villain yet, especially when there are still so many guys left that I can’t keep their names or stories straight. Jen K.: I feel like to be a villain you have to be somewhat self-aware of your villainy. Male model is just too self-absorbed to be remotely self-aware in any regard, which makes him all the more ridiculous, but not necessarily evil. I find him more amusing than anything else. He is literally a Ken doll. Villain for me is someone who stirs the pot, is out for himself, or is just plain old mean. Then again, Male Model could be the devil. I can’t really tell who is going to be a villain yet, but I am on red alert. By the way, am I supposed to learn names? Because I’m calling him Male Model forever. Chelsea: Jordan is more of the jester this season than a villain. He isn’t malicious with his actions and really is there to be silly. Lincoln, on the other hand, cheated his way through a date and stirred up drama with the guys immediately after. That’s who I would watch out for. Group dates got weird quick this season with a race to the altar obstacle course and a kid-coached dodgeball tournament. Adding in Blake’s bizarre one-on-one date, which date would you liked to have been on? Would any of the men get your rose? Alisa: Uhhh yeah, those dates were not great. And at this point the obligatory obstacle course and sporty dates have gone stale. Like, we get it. These are macho men who are big and strong! Enough. How about a date that actually teaches you something about the guy? Instead of a "ball and chain" obstacle course complete with tuxes and wedding cakes, maybe a panel discussion on who the men voted for in 2016 and why, and a debate on contemporary issues like poverty, immigration, and gun control. But I suppose that wouldn’t make great TV. Ah, well. I’ll just have to pretend to be shocked when the happy couple inevitably ends their engagement because they (shockingly!) didn’t find out anything useful about each other during the season. Also, Clay would get all my roses; the other men can leave. Rebecca: All right, I loved the dodgeball date. The kids were absolute savages, and I probably rewatched the scene of the kids screaming “TRAAAASH” at least four times. The obstacle date was fine enough, but the drama with Lincoln’s picture was just annoying. Like, just don’t touch stuff that isn’t yours? Blake’s date was infuriating to watch. While I’m sure destroying Arie’s things is therapeutic for Becca, that’s something to do on her own time with her girlfriends, not as a first date with her potential future husband. I agree with Alisa about needing dates that dig deeper into the men’s personal lives and political beliefs, although ratings won’t go up to hear a bunch of Ken dolls talk about social issues that most likely don’t even affect them. Jen K.: What is with this show’s incessant need to remind Becca she was dumped? Arie is getting more airplay than he did on his season, which is many levels of gross. The whole Arie-themed date was really uncomfortable and weird. Epic fail. Let us never speak of Arie again. I’m also confused on how obstacle courses are illuminating marriage potential, but whatevs, producers. Wedding themes this early on in the competition feels like jumping the gun, but it’s also possible I’m watching The Bachelorette wrong. And I’m with y’all. Let’s run through religious and political leanings. Maybe explore money management styles. Those kids were savage though, and I loved it. I feel like Connor escalated quickly over something pretty small. It’s a picture, dude. Calm down. So his temper is wildly concerning. Then Lincoln tattled and cried over a photo with a woman he’s known for five minutes. Are these guys for real? I’m looking forward to when it stops feeling like a sales pitch whenever these dudes sit down with her. Do they always kiss after first conversations? We don’t work up to kissing? I might be too old for this. Random thought: Becca slayed in the red jumpsuit. Chelsea: Somebody PLEASE get me a GIF of those kids yelling "TRAAAAAASH" at the men. Best moment of the entire show. I’m with Rebecca in that destroying all the Arie stuff is something you should do with your friends, not on a first date. That should’ve been a montage in the first episode with Caroline, Seinne, Kendall, Bekah, and Tia. I am so impressed though that they got a real artist with a recognizable hit song on the show. I’ve been convinced for several seasons now that they just grab a person off the street who can carry a tune and give them a fake name. The dudes always bring the best kind of petty drama that shows their true colors, and that’s why I like these competitive dates. It’s not so much who wins as much as how can they handle the pressure. I really found myself loving Wills and how he stayed out of all the messes. Him, Clay, and Leo would get my roses for sure. The men always bring bigger drama than the women and this year is no exception with Lincoln vs. Connor, Model vs. Chicken, and the Tia/Colton of it all. What is your favorite mess to cheer for? Who’s the most cringeworthy guy? Alisa: Lincoln’s a literal hot mess and I’m so bummed by the rumors that he’s a jerk IRL, but he does make great TV so I hope he sticks around for a while. The male model has already started grating on my nerves and it’s only week two, so I’d be happy to see him leave next week. Connor’s temper is just downright troubling and he does not need to be there anymore. And Colton? Okay, there is a guy obviously there for all the wrong reasons, and I can’t wait for Tia to spill the tea on this situation next week. I hope she gives us ALL the dirt! Rebecca: I agree with Alisa about Lincoln; I’m so disappointed if the rumors are true! He is one of my favorites so far, and he’s totally entertaining. Model vs. Chicken is definitely my favorite feud as of now, because Jordan is a mess and David (is that the chicken’s name?) is turning out to be more and more normal and sweet. It’s hilarious to watch the guys get so mad he stayed around. Colton and Connor are both cringeworthy and should see themselves out. 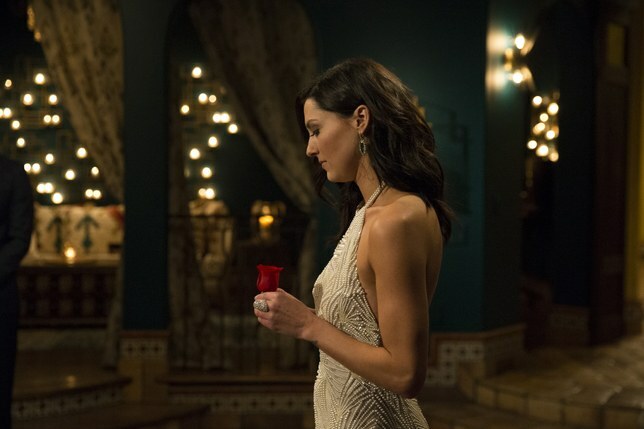 Jen K.: My biggest question with Male Model’s stunt is where does Becca pin the rose? The self-involvement with that guy is unreal. He can go. Is Colton just working his way through bachelorettes? Umm... no. The whole Tia thing is a big red flag. Colton also should have fessed up on night one; he can go. Lincoln feels untrustworthy; he can go. Connor has anger issues; he can go. Stick with me, Becca! I’ll have whittled this down to the one in no time. Chelsea: Colton is the Arie of football players in that he’s never really done anything and is just looking to capitalize on fame (see Aly Raisman viral video), and I am already so over him. You know this drama will let him go far but he’s gonna end up on Paradise trying to win back Tia. The show is literally writing itself. Model vs. Chicken is definitely the funniest one to watch because they’re both driving each other crazy and there are no real stakes. Lincoln v Connor seems like where the real mess is at and both guys are coming out of it looking really bad. Looking ahead, who do you have in your final four going to hometowns this season? Do any of these men have Bachelor potential? Alisa: Can we just have a moment of silence for the loss of the Fantasy League? I’m super bummed they’re not doing it this season. Okay, moment over. So I’m not ever good at guessing this early in the game, but I do think Garrett is final four for sure, based on how quick the producers, Becca, and he have been to put distance on his Instagram actions. I think Clay is doing hometowns as well because they already showed his family sitting down to dinner in the night one intros which I think is a good sign — like, I’m guessing that was footage from a hometown date. You can’t tell me the producers would waste precious time filming some big, staged family dinner for a rando who gets let go in week three. I’d really like to see Lincoln go to hometowns, mostly so I can just stare at him and listen to that accent for as long as possible. The only other guy that even made the remotest impression on me was Leo, because my goodness, that hair. So, yeah, those are my picks: Garrett, Clay, Lincoln, and Leo. Rebecca: My final four are Garrett, Clay, Blake, and Lincoln, mainly for the same reasons as Alisa stated above. I traded out Leo for Blake though because her one-on-one with him seemed to go so well. Jen K.: Can I pick Clay four times? No? That’s not a thing? Okay. Alisa is 100% on point with Garrett so I’ll say Clay, Garrett, Blake and... I can’t remember a fourth name. Chelsea: I miss Fantasy League so much. Pouring one out for all the dumb questions we’ll never get asked. My personal Final Four would be Clay, Wills, Blake, and Jason but I think Becca will go with Blake, Garrett, Colton, and maybe someone who hasn’t had a lot of screen time yet. There’s always one person who jumps out around episode five or so — like a Kendall — and captures our hearts. I’m feeling pretty meh on her batch of dudes, but her season is already more fun to watch than Rachel’s or Arie’s because I think Becca is more game for it all.